I would show you a few shots from the kitchen. Christmas in our kitchen is really more about cooking and being together than decor. We all love food and cooking in our house. This little house below was made by my son when he was about 5. Do you still have all of those things? Yes, I do. They make me smile and remind me of my freckledy little boys. Love my new Santa. He jumped in my cart the other day at Kohls. You know I have a love of cup towels. I've talked about that before. The stove is just waiting for something good. Do you like my silver tray hanging there? This tray was passed to me by my aunt many years ago. I completely copied the idea of hanging it from Jennifer Rizzo. 1. I can not get enough of this song, "I Heard the Bells on Christmas Day" by Casting Crowns. You can click on the song title if you want to hear it. And if you are like me you can play it over and over again. 2. I haven't forgotten the give away I mentioned last week. How about I give you a peek tomorrow but if you want to be included start telling me now! Remember the give away is inspired by my love and admiration of Susan Branch. I would love to be included! I am enjoying all of your posts about your new home. Now that I am back at work it is difficult to comment very often but I am still out there. Have a great day and a Blessed Holiday Season! I love the tray on your backsplash! SO pretty. And I like your Santa, too. Your kitchen looks fantastic!!! And festive! I will finish decorating as soon as our fresh greenery comes in. 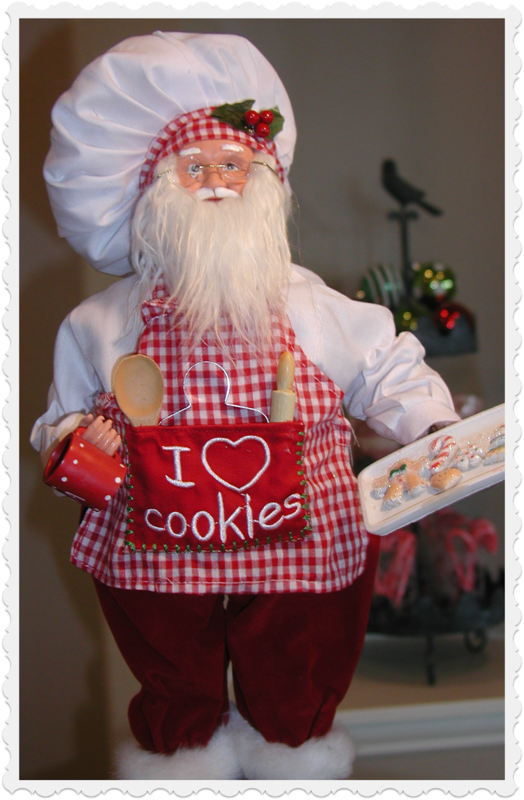 Love your holiday kitchen decor! That Santa is so cute!! And I love your towels! The tray is gorgeous; and I love how you've displayed it. Please count me in for the giveaway! I had to laugh about the towels...I'm the same way, especially with the guest towel in the bath! Do Not Touch! lol! Your snowman is very cute, perfect for your kitchen and I definitely love the tray! Your giveaway sounds great, I love Susan's blog. She is having a nice giveaway now, too! That's such a great place to hang a silver platter. We got one 23 years ago as a wedding gift...I might just have to try that! Can't wait to hear more about your giveaway...count me in! I love all of your little Christmas touches in the kitchen. 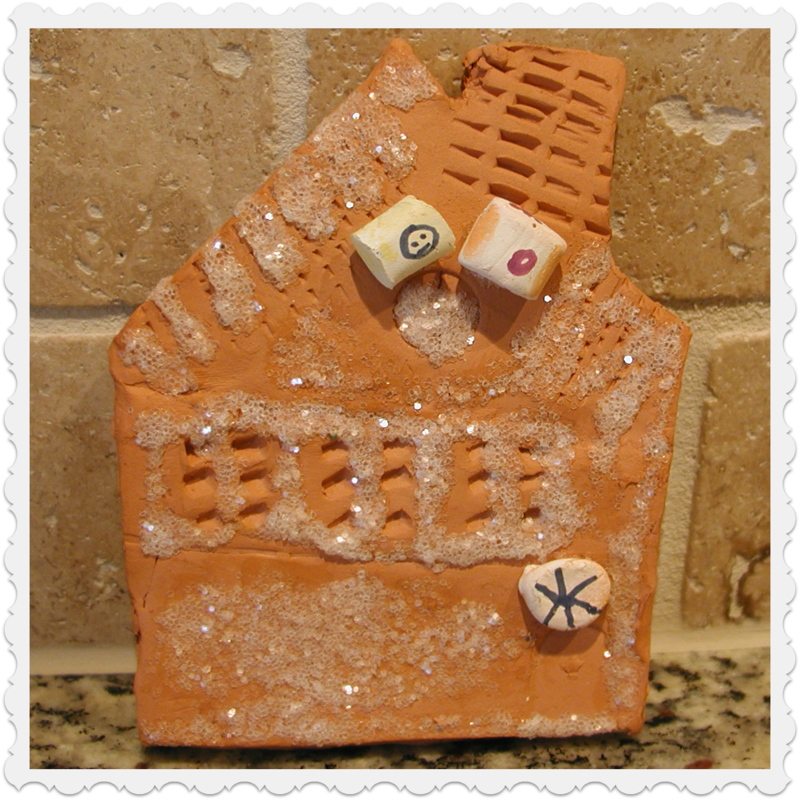 The little house made by your kids is so sweet and so is the nice comment they made about your cooking. I'm pretty sentimental about those gifts made by the kids. I still have them too. I'm curious to see what you have in store for your giveaway. I'm putting together a little giveaway which also includes a little bit of SB love. Don't you love her blog? So fun. What a clever idea to put that tray there. I have been reading Susan's Willard this afternoon. I'm a big fan. Stopping by from the WOW party. I love that Santa! I really like the silver tray hung behind the stove! Hi Stacey! Oh,I'm loving getting a peep at your kitchen and it looks beautiful! Your new Santie is so cute! 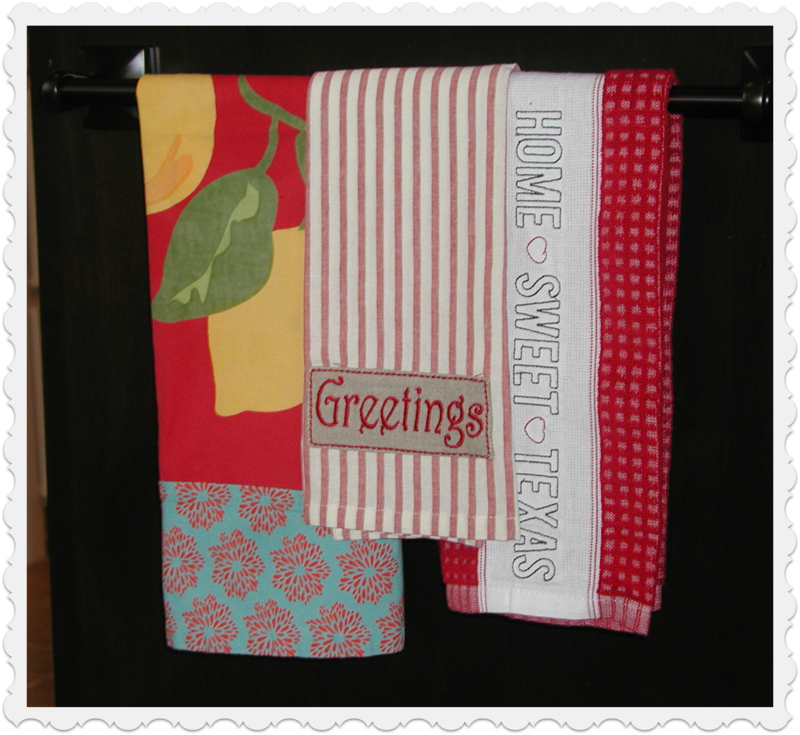 Love those pretty tea towels. I really like the tray on your bricks and that looks like an awesome cooktop. Your kitchen looks so pretty, Stacey! 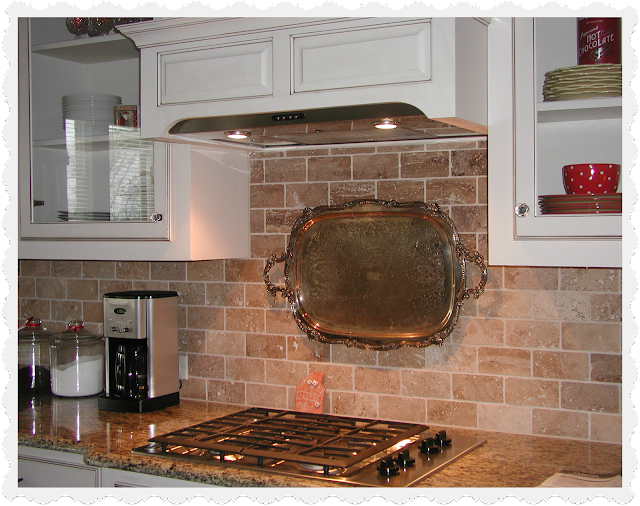 I love that you hung your silver tray over the cooktop. It's perfect there! 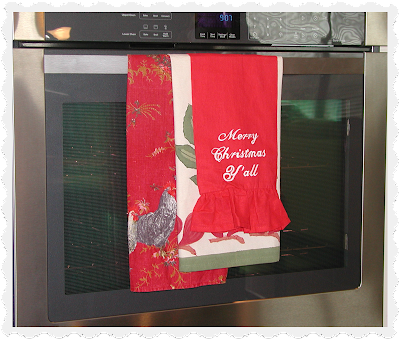 Love all of the Christmas touches in your kitchen. The baker Santa is adorable! That music is great too. Took a listen and it's wonderful. Hi Stacey! Your kitchen is just beautiful, or at least the little peeks you've shown us so far. I have a tray hanging over our cook top that I change out every now and then, but it never occurred to me to hang a silver tray. It looks amazing! I might have to give that one a try! And I love your Santa. Funny how things can hop into your cart when you're not looking, isn't it? But most of all, I love the little gingerbread house your son made when he was little. Those things made with little fingers are so so precious. I can just imagine the look of concentration on his face as he was applying all that glitter, can't you? Thanks for sharing it with us. Your house looks so festive and pretty. 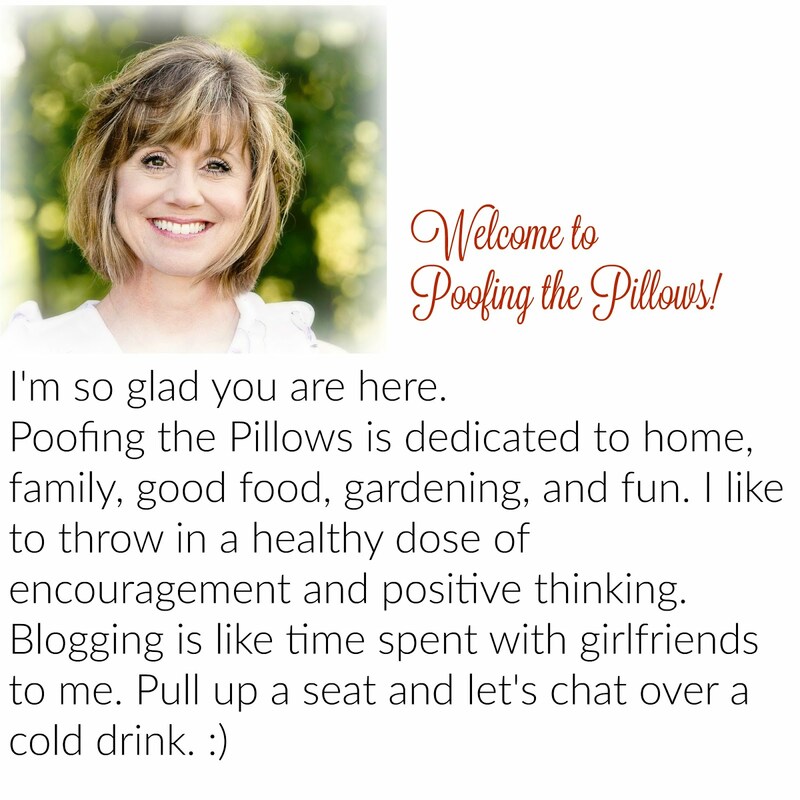 I can't find your blog on my blogroll...I'm going to add it again and see if it shows up! Sweet hugs! Would love to see more of your kitchen. It looks so pretty. I have towels that are just for show for every holiday. Yours look so cute on your oven. The silver tray is perfect over your cooktop. I would have never thought of that. So special because it is a family heirloom too. You have reminded me to get my Christmas kitchen towels out. :) And congratulations to Olive Out on winning your wonderful give-away.